In small bowl, blend mayonnaise, lime juice, and celery salt; set aside. Slice sandwich rolls in half; toast or grill and keep warm. Rinse any ice glaze from frozen Alaska Salmon under cold water; pat dry with paper towel. Heat a heavy nonstick skillet over medium-high heat. Brush both sides of salmon with oil. Place salmon in heated skillet and cook, uncovered, about 3 to 4 minutes, until browned. Shake pan occasionally to keep fish from sticking. Blend cooked onions into mayonnaise mixture; thinly spread mayonnaise onto each cut side of roll. Place a salmon fillet onto each roll bottom. 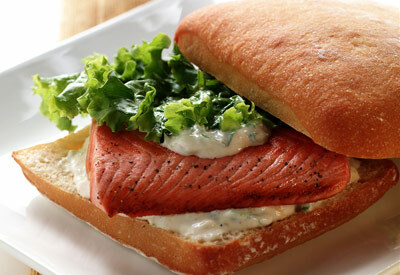 Top salmon with dollop of mayonnaise; add a lettuce leaf and roll top.